One of a kind guide to the best sailing experience in Split area, Croatia. Written by an experienced skipper this e-book introduces you the best sailing routes, the best marinas and ports, and, last but not least, the best restaurants in the area. The most interesting destinations in Split area, some popular, some off the beaten track: Trogir, Maslinica, Paklinski otoci, Šćedro, Komiža, Biševo and Vis. Recommended marinas and bases, all visited on multiple occasions by our skipper-writter. Moor your yacht in Rogač, ACI Split and Bobovišća. Sailor's favorite restaurants in Split region – our writter visited many restaurants in the area and talks about the best ones in Trogir, Vis and Hvar. If you are feeling competitive we wrote about the best regattas in Split region: Viška Regata and Mrduja Race. We have prepared four routes in Split area, routes to take you to the best heritage and nature attractions of this part of the Adriatic. 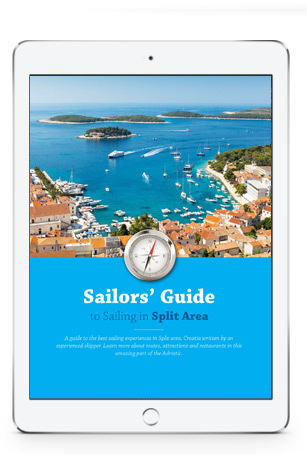 Download your free e-book to learn more about sailing in Split area, Croatia. Hope you will enjoy this guide to your perfect sailing vacations.